Effective people management is critical to the success of any organizational change effort. 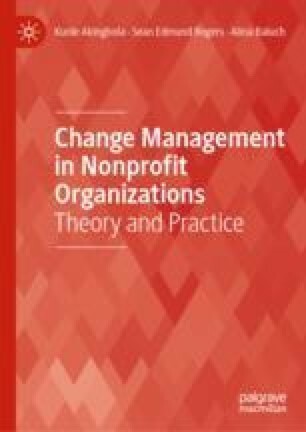 This chapter focuses on how to effectively manage people before, during, and after organizational change in ways that enable successful change outcomes and enhance nonprofit organizational capabilities and performance. We begin with a high-level discussion of the roles people play in successful organizational change, and how to prepare employees for change. Then we consider individual and organizational characteristics that can influence the way employees experience change. These factors include employee attitudes, emotions, personality, motivation, training and development, performance management, and compensation and rewards. Finally, we discuss the importance of creating the conditions needed for successful change management, specifically exploring the role of leadership, organizational culture, and power in effective change management. Austin, J. (2015). Leading Effective Change: A Primer for the HR Professional. SHRM Foundation’s Effective Practice Guideline Series. Retrieved September 13, 2018 from https://www.shrm.org/foundation/ourwork/initiatives/building-an-inclusive-culture/Documents/Leading%20Effective%20Change.pdf. Colbert, A. E., Kristof-Brown, A. L., Bradley, B. H., & Barrick, M. R. (2008). CEO Transformational Leadership: The Role of Goal Importance Congruence in Top Management Teams. Academy of Management Journal, 5181–5196. https://doi.org/10.5465/AMJ.2008.30717744. PwC. (2013). Culture’s Role in Enabling Organizational Change. Retrieved October 2, 2018 from https://www.strategyand.pwc.com/media/file/Strategyand_Cultures-Role-in-Enabling-Organizational-Change.pdf. Queensland Government. (2017). Managing People Through Change. Retrieved September 22, 2018 from https://www.business.qld.gov.au/running-business/employing/staff-development/managing-change. Society for Human Resource Management. (2018). Managing Organizational Change. Retrieved September 15, 2018 from https://www.shrm.org/resourcesandtools/tools-and-samples/toolkits/pages/managingorganizationalchange.aspx. World Health Organization. (1994). Global Strategy on Occupational Health for All: The Way to Health at Work. Retrieved October 1, 2018 from http://www.who.int/occupational_health/publications/globstrategy/en/index2.html.